Garnet and Sterling Silver Dangle Earrings from India, "Sparkling Red Leaves"
Red leaves fall from the earlobes in this pair of Indian dangle earrings. Vibrant and enchanting, the earrings are handcrafted from sterling silver, featuring 14 carats of garnet stones. Neeru Goel designs these earrings, pursuing her childhood passion for jewelry and gemstones. These earrings are flawless and gorgeous January birthstone jewelry pieces! These Sparkling Red Leaf earrings by Neeru are very unique and beautiful. She does meticulous work. The are very light and comfortable. These earrings are of a good weight and great length. I bought these lovely earrings for my daughter-in-law who has been to India. She LOVES them! Beautiful, elegant, simple, yet sophisticated. The craftsmanship is excellent. I would definitely purchase these earrings again...and again...and again as gifts and also for myself! Could be elegant evening wear but also lovely for a dress-down occasion. "More beautiful than in the photo"
These dangle earrings are very pretty. 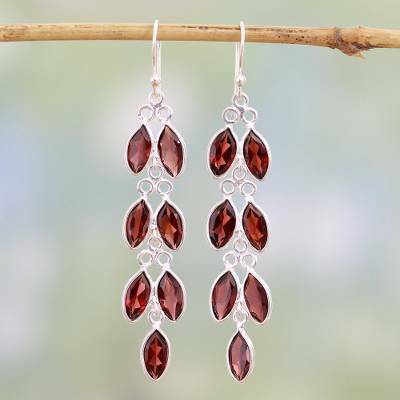 The garnets are bright and catch the light as they hang from the sterling silver leaves. "So Glad I Made This Purchase"
These earrings are lovely in person. They're comfortable to wear, the color is pretty and the silver adds a lot of sparkle. They're eye-catching when worn and I'm so glad I made the purchase. "Could not be more beautiful." Absolutely love these earrings. The colors are perfect. Nice and lightweight. My most treasured earrings. Thank you for your beautiful work.